There is still clearly widespread resistance to the deployment of formal methods in industry. On the other hand, certain fields of application, viz. VLSI design, protocol specification, and certain kinds of system, viz. safety-critical, real-time, have of necessity already deployed some form of well-defined engineering methods to ensure a high degree of robustness and reliability in delivered products. 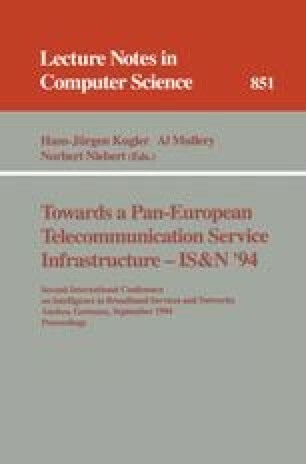 In the telecommunications field there is currently a sense of the inevitable in the absolute necessity for the ultimate deployment of formal methods for service specification. In this paper we begin by establishing our universe of discourse in order to de-mystify the term ‘formal methods’. Then, recognising the real need to justify yet again the use of ‘formal methods’ in industry, we set forth those principles by which management may be guided. Finally, we indicate exactly in what manner ‘formal methods’ may be embedded within a system development process model. For definiteness, our arguments are presented within the context of multimedia service specification, in which context we take the liberty to announce some new results. The results reported in this paper have arisen from work partially funded by the RACE Project Ref: 2017, Service Creation in an Object-oriented Reuse Environment (SCORE). The opinions expressed are those of the authors.